The ability to comfortably chew, enjoy and digest your food can be hampered when multiple teeth are missing. 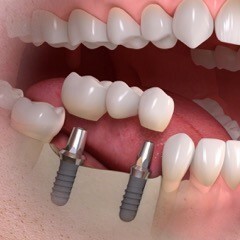 A great fixed alternative in a situation such as this is implant treatment. With this in mind, the two solutions available include individual, separate crowns on dental implants or a bridge attached to two or more dental implants. Neither of these options requires grinding down adjacent teeth or utilizing clasps to hold a removable partial denture in place. Having dental implants replacing your lost back teeth will give you new, unparalleled strength and stability that allows you to eat what you want. They also help preserve your jawbone and facial appearance. The implants are installed. 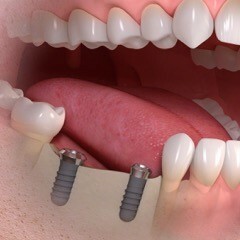 At this time, a temporary bridge or a provisional (temporary) appliance is provided. The implants will need a few months to integrate with the jawbone before the next step is taken. The final step is the placement of the permanent ceramic teeth. You will have a stable and secure solution that allows you to eat what you want. Contact our Shreveport office today to learn more or to schedule a visit.